Unfortunately, it's true. Your car's gas mileage decreases once it gets past its optimal speed. For most cars, this is around 55-60 mph. This means that every time you go over this speed, you're essentially wasting gas and money - and creating unnecessary greenhouse gases. You'd be surprised to learn that a slight decrease in your highway driving speed can significantly reduce your gas consumption, while only adding a few minutes to your travel time. Regardless of your vehicle, engine, or size, the numbers hold true. 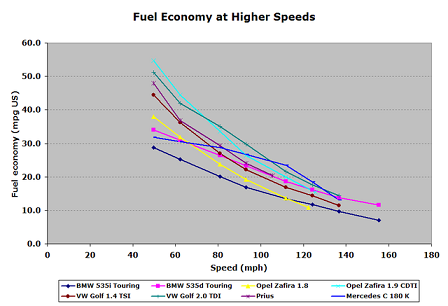 Green Car Congress did a study comparing different car model against this topic. 1) Increasing air resistance. According to CNN, "Pushing air around actually takes up about 40% of a car's energy at highway speeds. Traveling faster makes the job even harder...The increase is actually exponential, meaning wind resistance rises much more steeply between 70 and 80 mph than it does between 50 and 60. " 2) Engines are designed for specific speed, temperature, and rpm ranges. Driving out of these ranges goes against the fundamental design of the engine. If the national speed limit were reset to 55, it would save 1 billion barrels of oil per year. The old national speed limit of 55 mph was created to address the energy crisis in the early 1970's - not safety purposes (although it did help safety). This principle not only applies to cars, but other vehicles as well. Recently airlines have been slowing down their planes in an effort to ease fuel consumption. Most flights are being decreased by 10 mph, adding an average of 2-3 minutes more travel time in most cases. - Southwest Airlines will save $42 million in fuel costs per year.